For the first time, the U.S. Geological Survey has released a map predicting the likelihood of both man-made and natural earthquakes in 2016. The addition of unnatural quakes — caused by fracking — puts another 7 million Americans at risk of being affected by a quake. 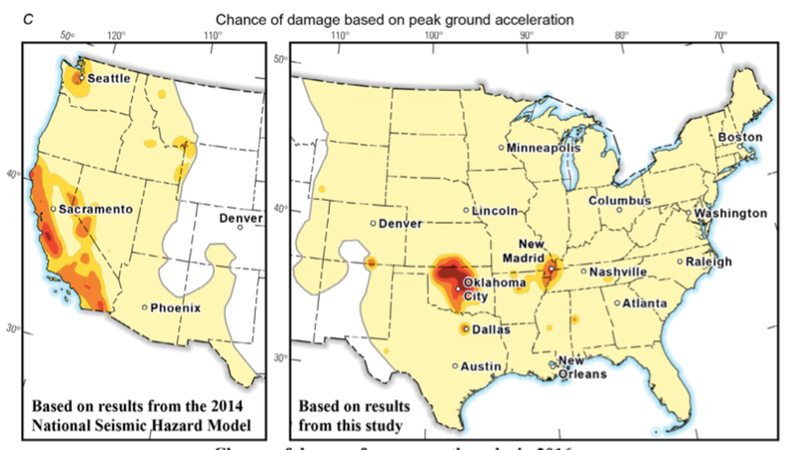 “By including human-induced events, our assessment of earthquake hazards has significantly increased in parts of the U.S.,” Mark Petersen, who heads the USGS National Seismic Hazard Mapping Project, explained in a statement. Oklahomans are the most likely to see man-made earthquakes in 2016, followed by those who live in Kansas, Texas, Colorado, New Mexico and Arkansas. Petersen said that "in the past five years, the USGS has documented high shaking and damage in areas of these six states, mostly from induced earthquakes." Effectively, what's happening is that central states are seeing risks of earthquake comparable to California's, where natural fault-lines make for a volatile environment. Earthquake rates have recently increased markedly in multiple areas of the Central and Eastern United States (CEUS), especially since 2010, and scientific studies have linked the majority of this increased activity to wastewater injection in deep disposal wells… Between 1980 and about 2010, CEUS earthquake rates were relatively stable, but recent rates in some areas have increased by more than an order of magnitude. The wild increase has caused officials in Oklahoma to take notice—lawmakers are calling for a 40% reduction in fracking wastewater injection volumes in an attempt to stave off future quakes. Even though induced earthquakes are not considered in building-code maps, they create seismic hazard to buildings, bridges, pipelines, and other important structures and are a concern for about 7.9 million people living in the vicinity of these events. Several damaging earthquakes have occurred recently near injection wells. Evidence suggests that earthquake risks can spread for miles beyond the original disposal sites, and can persist for a decade or more after drilling stops. And although the biggest earthquake from wastewater injection was a 5.6 on the Richter scale, near Oklahoma City in 2011, scientists think that temblors as powerful as 7.0—enough to cause fatalities and damage buildings across a wide area—are possible, although unlikely. Guess more people will get use out of the government's nascent earthquake alert system than expected.